The series, so far, in a word? Relentless. Terrifying. Agonizing. Both heartening and disheartening. Okay, it’s impossible to keep it to one word, but you get the picture. Your reading experience will fluctuate with feelings of anger at the corruption and lessons in futility. From hopelessness and despair, to moments of elation and encouragement. Sadness from loss, to beauty in the stolen moments of tenderness and bonding. And even an occasional chuckle here and there to lighten the mood. But whatever is happening, I can assure you… you will be feeling every moment. Oh! Here’s a word that just popped into my head that describes this series for me, so far. Awakening. 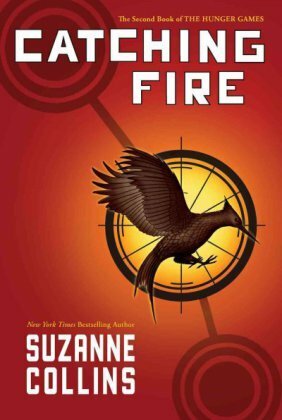 Book one ends where the audience and the Gamemakers have completely fallen in love with Peeta’s and Katniss’s love story, and both are allowed to survive the Hunger Games and win as a team (instead of the whole “last man standing”, where one HAS to kill the other). A MAJOR rule-bending to please the crowds. Both are crowned, celebrated, and rich! Here’s the kicker. Both are also expected to continue with their love story, as *that* is essentially what saved them. This is fine for Peeta. He is unconditionally in love with Katniss, and has been since they were little. And while Katniss feels *something* for Peeta (and I do believe it is love – although she’s not quite *there* yet to admit it), she has spent most of her teen years in the comfort and friendship of another boy (Gale). One that she has come to depend on, and love, as family. But as her relationship with Peeta deepens during the games, guilt arises as she thinks of Gale at home. Knowing that he watched her televised “love affair” with another man distresses her. Gale and Katniss may not have entertained a deeper relationship in the past, but now that they are apart, it becomes so obvious to her how they’ve always felt about each other. And now, as Peeta and Katniss arrive home to District Twelve, she distances herself from Peeta, letting him in on the fact that her love was mostly an “act” – part of the game plan for them both to come out alive. She knows Gale is waiting for her. Peeta is devastated, but after all Gale has witnessed, so is he. Hardly anybody know me better than Hazelle. Knows the bond I share with Gale. I’m sure plenty of people assumed that we’d eventually get married even if I never gave it any thought. But that was before the Games. Before my fellow tribute, Peeta Mellark, announced he was madly in love with me. Our romance became a key strategy for our survival in the arena. Only it wasn’t just a strategy for Peeta. I’m not sure what it was for me. But I know now it was nothing but painful for Gale. My test tightens as I think about how, on the Victory Tour, Peeta and I will have to present ourselves as lovers again. Katniss tries to move on with her new, privledged life. She is forced to fluctuate between her “onstage” relationship as she tours the Districts with Peeta (who suffers his love in silence), while she secretly meets up with Gale, continuing to confuse him even more. The only time I really get to see Gale now is on Sundays, when we meet up in the woods to hunt together. It’s still the best day of the week, but it’s not like it used to be before, when we could tell each other anything. The Games have spoiled even that. I keep hoping that as time passes we’ll regain the ease between us, but part of me knows it’s futile. There’s no going back. Both men *understand* why, and where they all are in this, but the pain is too fresh to ignore. And while this may seem like a messy love story (and it is), there is SO much more to the series than that. In fact, my focusing on the “love” aspect might actually cheapen the real problem at hand. One that encompasses the people. A story of oppression, and a corrupt government intent on keeping it’s citizens down. Dicatorship, tyranny, threat of public humiliation and death of loved ones, keeps everyone in line. They remain slaves to those that hold power. They have no real future. No possibility of wealth, advancement, health or freedom, as long as President Snow has his say. His power is far-reaching. His control, complete. President Snow acknowledges something in Katniss that displeases him greatly. Her strength, her intelligence, her rebellious nature and most of all, her spirit, televised for all the world to see. He notices the beginning signs of rebellion amongst the districts. A potential uprising against the government (The Capitol) is brewing, and all because of Katniss’s determination to stay alive in the games, and to keep Peeta with her. Her success at changing something that was unchangeable (the Hunger Games), gives the people hope. He gives her one last chance. Convince the public on her tour that she was simply a love-crazy teen girl, and not defiant. Defuse the rebellious spark she unintentionally ignited in the Games, that is quickly spreading through the Districts. A visit from President Snow. Districts on the verge of uprisings. A direct death threat to Gale, with others to follow. Everyone I love doomed. And who knows who else will pay for my actions? Unless I turn things around on this tour. Quiet the discontent and put the president’s mind at rest. And how? By proving to the country beyond any shadow of a doubt that I love Peeta Mellark. What will he think of this very public salute to the girl who defied the Capitol? The full impact of what I’ve done hits me. It was not intentional – I only meant to express my thanks – but I have elicited something dangerous. An act of dissent from the people of District 11. This is exactly the kind of thing I am supposed to be defusing! And while publicly, President Snow cannot rid himself of her, (their “mockingjay” – their symbol of hope), he has other plans. This year is the 75th “Hunger Games” and he has announced something special. The contestants from each district will be picked from the past Hunger Games “winners”. You guessed it. Since Katniss was the only female winner from District Twelve, she’s back in the game. And… Peeta follows her. Oh wow!!! Just wow. The whole strategy this time changes, and well… The devastation I felt, for her (and all of the past winners) forced to be subjected to that impossible situation again, was overwhelming. I mean, there was an 80 year old woman in the mix, for *&%#’s sake!! Woops, sorry 😉 I’m still appalled by the whole process. Anyway, as you’d expect, strategies go awry… or do they? And can I just say… OMG!! This has been a nightmare ride for her (and me!!). But I can’t stop reading! This is more than a story about a few people. It is about an entire nation. Adversaries and allies. The fear of losing, but the hope of winning a future that once seemed so bleak. Shall the meek inherit the earth? I don’t know, but I’m off to book three to find out!